Accessing all of your target markets and customers is an essential component of a project’s success. Partnering with Asuragen offers you access to a highly experienced regulatory, manufacturing and clinical testing team. 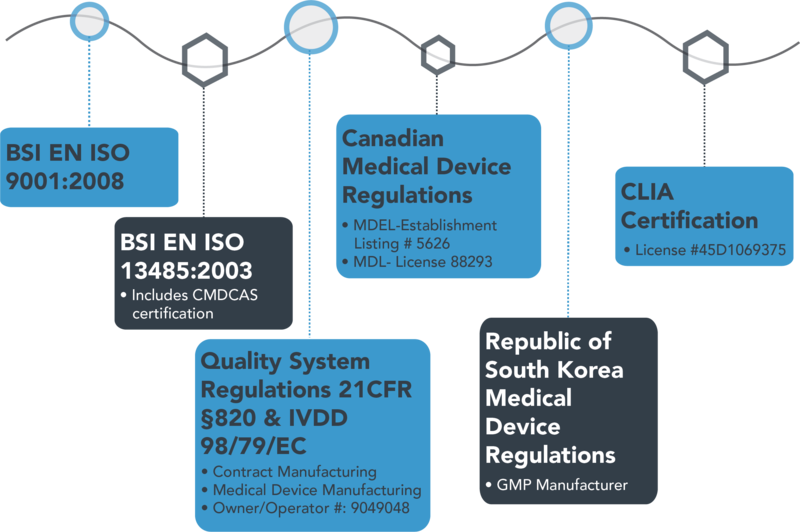 Our proven performance is highlighted by our history of successfully navigating a broad range of regulatory clearances worldwide for both our own products and our partners’ products. This expertise in negotiating complex and diverse global regulatory paths, in combination with our established cGMP manufacturing and clinical testing capability, helps maximize your product’s potential. Asuragen offers clinical testing for both prospective and retrospective studies, with extensive expertise in the development of CLIA validated clinical trial assays. Our dedicated staff brings experience and the technical resources needed to successfully support clinical trial testing. Asuragen’s Clinical laboratory is CLIA-certified and CAP-accredited, GLP, and HIPAA compliant. We offer flexible, platform-agnostic genomic testing programs and the ability to validate standard assays and custom developed biomarkers in our CLIA and GLP laboratories. Our laboratories follow the same design control processes established for commercialization of our diagnostic kits, enabling the seamless transition from an analytically validated clinical trial assay to an IVD. Asuragen’s laboratory is licensed/certified under the Clinical Laboratory Improvement Amendments of 1988 (CLIA 88) and the requirements of the state of Texas licensure program. The Asuragen laboratory is accredited by the College of American Pathologists (CAP). Assays analytically validated in Asuragen’s CAP-Accredited CLIA lab with quality assurance oversight compliant with 42CFR493 regulations and the guidelines established by the 2009 AMP Clinical Practice Committee as well as the 2012 CAP molecular checklist. Asuragen has extensive experience and knowledge in manufacturing diagnostic reagents in its FDA-regulated cGMP facility. We produce thousands of reagent kits and controls that are deployed for diagnostic use on a daily basis. This proprietary manufacturing know-how and proven cGMP capability has translated into multiple partnerships for QC material across diverse molecular targets. We are currently in the process of implementing a PMA-ready manufacturing facility which we expect to bring fully-online in early 2017. Asuragen understands that early strategic regulatory planning is essential to ensure the diagnostic development plan is acceptable to the regulatory agencies and will support obtaining clearance. This is particularly relevant in the US FDA CDx environment where acceptance of the plan by regulatory agency is essential to supporting the drug approval. We deploy our Regulatory Affairs department in early CDx project planning stages in order to ensure alignment of development and regulatory processes to the “Intended Use” of the test. This approach, aligned with the FDA Pre-IDE process, ensures we extend our extensive regulatory experience in IVD and CDx to help you maximize your chances of success. Medical device manufacturer compliant with 21CFR§820 and ISO 13485: 2003 Quality Systems Regulations. See full list below.